1) Gert Postel's only degree was his letterhead. 2) The psychiatric clinic where he was head physician.3) A sign in the "Gert Postel clinic". 4) Gert Postel in court in 1999. 5) Queuing public to Postel's reading in Dresden City Hall while he is being interviewed by the Saxonian state TV channel. 6) Postel reads from his book in a packed hall. 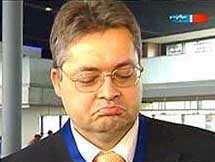 Prof. Kallert is full of expectation to extol his achievements on coercive treatment to the TV public. Prof. Kallert is really disgusted with the media for only being interested in the Postel experiment. You certainly still remember Gert Postel well, the convincing imposter, who curiously without training and also without problems managed to work his way up to Head Physician in Saxonia? In 1999 he was sentenced to 4 years detention for repeated fraud and falsifying documents. Meanwhile Postel lives in Marburg and writes books. From postman to Head Physician of a psychiatric hospital, not everyone can achieve that! Gert Postel, imposter from Bremen succeeded that temporary jump into the honourable society. 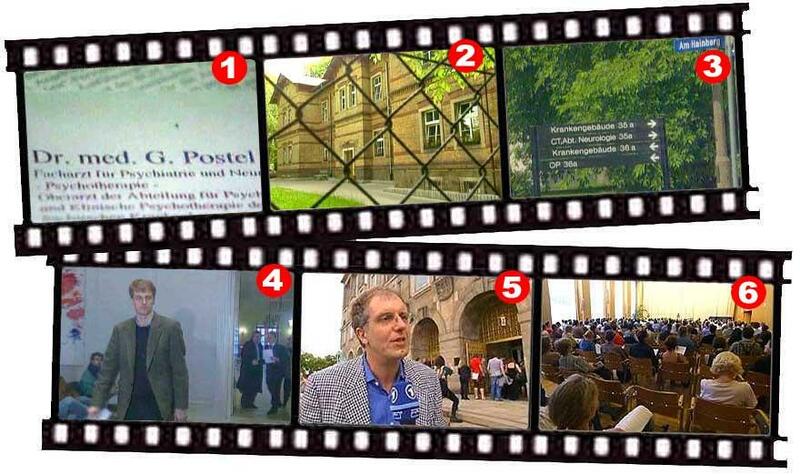 Flash back: In the mid- 90's Postel from the post office sneaked into a post in the medical service. With falsified references and an absurd lecture, Postel struck the 40 other doctors from the field, became a Head Physician in the Zadrasch psychiatric hospital in Leipzig. Postel: "There the chairman asked me: 'What did you write your doctorate about?' and I replied: 'About cognitive induced distortions of the stereotyped judgement formation'. That is a lining up of empty terms and his only answer was: "Yes, oh you will certainly feel at ease in Leipzig", you know? And that as imposter among imposters!" The committee was overwhelmed! Postel soon became a Supervising Head Physician. A world congress of psychiatrists in Dresden now once again prods the 48 year-old into action : "All hot air there! ", according to Postel. 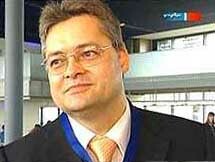 "I was training representative for the Saxonian Chamber of Doctors, which in itself is a joke. I introduced disease terms which do not even exist, e.g. the 'bipolar depression of the third degree', in front of 120 psychiatrists and not a single one dared to ask a question." Mr. Postel with regard to psychiatry is - let's say - a great sceptic. Does he have a good reason to be one? [Shrugging his shoulders] Oh, you know, Mr. Postel is - as far as I know - a convicted imposter. Actually one shouldn't believe anything an imposter tells you. Nevertheless in the evening hundreds of people came to Postel's reading in the Dresden City Hall. The self-named "social critic" was content. - "He is clever and I am a sympathizer, if you want an exact reply." - "I have no idea. I am here because I would like to see an imposter." - "Somehow I compare him with the "Captain of Koepenick." In autumn Gert Postel will publish his new book, because he certainly does not want to be a postman anymore. We can definitely trust him about that! "Prof. Thomas Kallert is the organizer of this strange Congress of World Psychiatry and a few weeks ago Prof. Kallert spoke with the department head for culture of the news magazine "Der Spiegel" and they intently discussed the subject of psychopathology, namely the psychological illness of Gert Postel. In answer to the question by this Mr. Matussek, the editor from "Der Spiegel", as to whether Mr. Postel would have been able to fool him, he replied: "After 5 min flat during the job interview I would have seen through him." Even today, Prof. Kallert is still of the opinion that he really telephoned with the department head for culture of "Der Spiegel"."